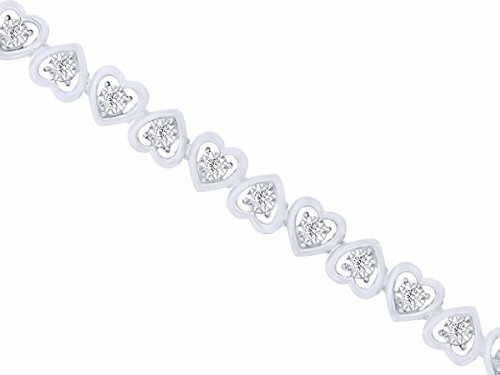 Jewelry has the power to be this one little thing that can make you feel Unique, You're going to love this Round Cut White Natural Diamond Heart Link Bracelet in 14k White Gold Over Sterling Silver (0.07 Cttw) 7.25 " . Absolutely a great gift to express your love for your mother, girlfriend, fiancee, wife, valentine, family or just a friend,etc. Great gifts on Mother 's Day, Wedding, Anniversary day, Valentine's Day or Christmas Day. If you have any questions about this product by AFFY, contact us by completing and submitting the form below. If you are looking for a specif part number, please include it with your message.